Best value dog muzzle for large dogs! 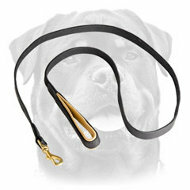 Compact Leather Dog Muzzle is introduced to you today! 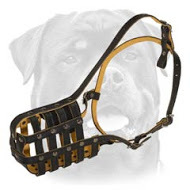 This muzzle is exceptionally handcrafted by our experienced manufacturers. 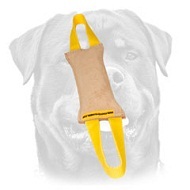 Best dog muzzles can be found only in our pet boutique!! 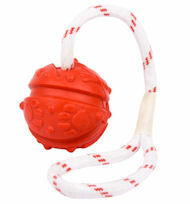 We have been producing dog goods for years!!! 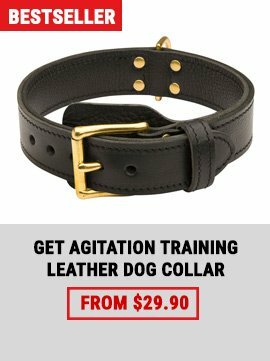 Your dog is extra aggressive? Can’t find a reasonable solution for this common challenge? 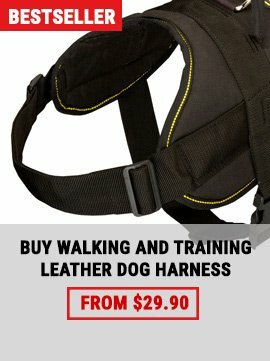 Afraid of trying a new dog gear? You were unlikely to have bought a number of poor muzzles or other essential dog accessories? 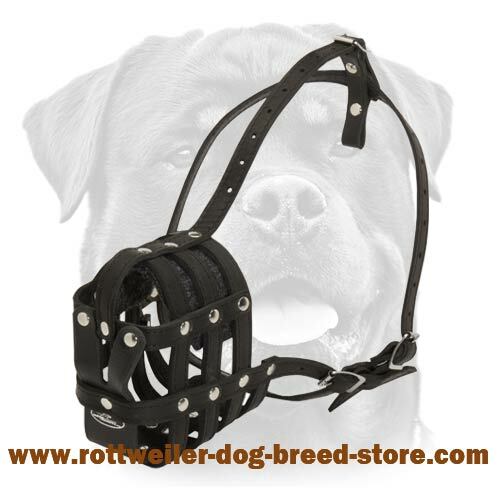 Then we are very pleased to offer you incredibly reliable and comfortable leather dog muzzle for your Rottweiler! 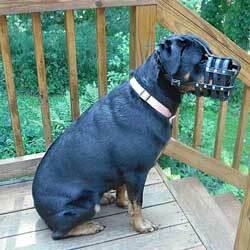 Even well-behaved dog sometimes needs to be muzzled. Our production meets all the requirements and standards. 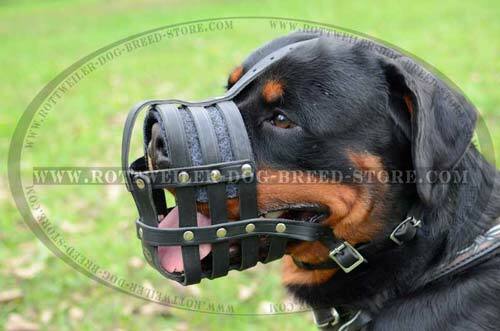 Moreover, this muzzle is the most replicated sold worldwide. 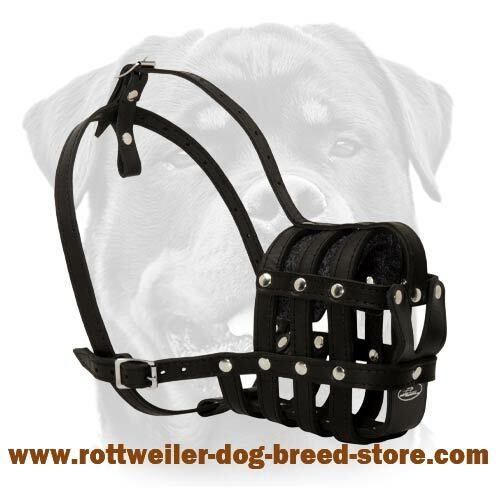 If you look for safety, durability and protection of dog equipment you will definitely find them in this muzzle. 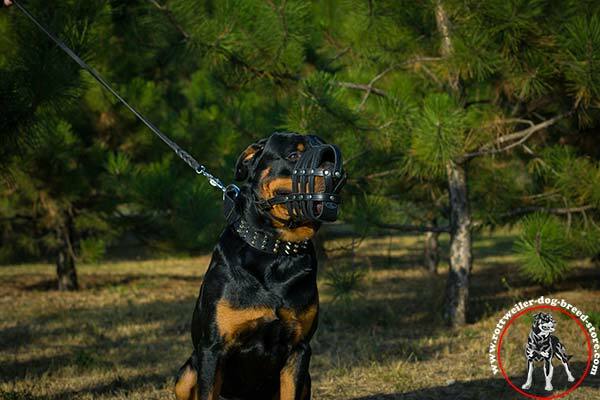 This muzzle is designed for Rottweilers particularly but can be used for many other dog breeds similar in shape and size. Manual working. At present manual working is nothing but the salvation of mankind of computerlike and faceless presswork stuffing whole shooting match. Individuality, atypical approach and formalism of every detail of this buy-today leather basket muzzle are integral parts of handiwork. Individuality, in other words a private style, extols a man over everydayness and makes it inimitable. Leather straps shaped in mesh basket. Leathern products are ones of the best for wearing. They are natural and consequently do not contain any chemical matters thus being absolutely non-toxic that equals to perfect health status of your pet. 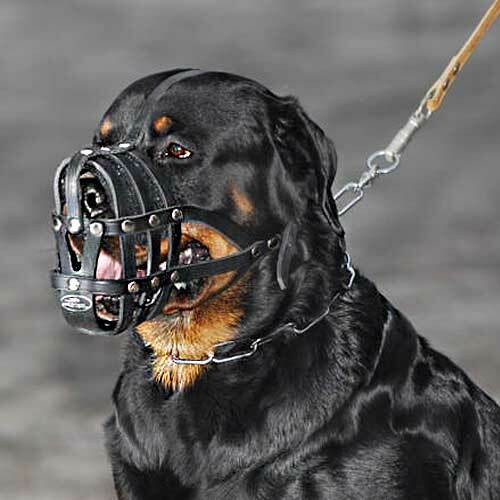 This muzzle neither absorbs heat and nor sticks to Rottweiler’s snout in bitter cold. Due to its open design dog’s skin does become wet. Stylish&Practical design. 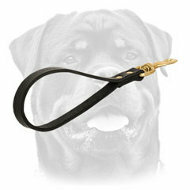 Sophisticated model inclusive of all main purposes this dog equipment was meant for. 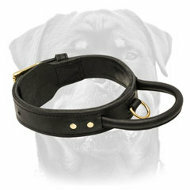 It has two adjustable leather straps and a leather loop used for attachment the muzzle to the dog’s collar. 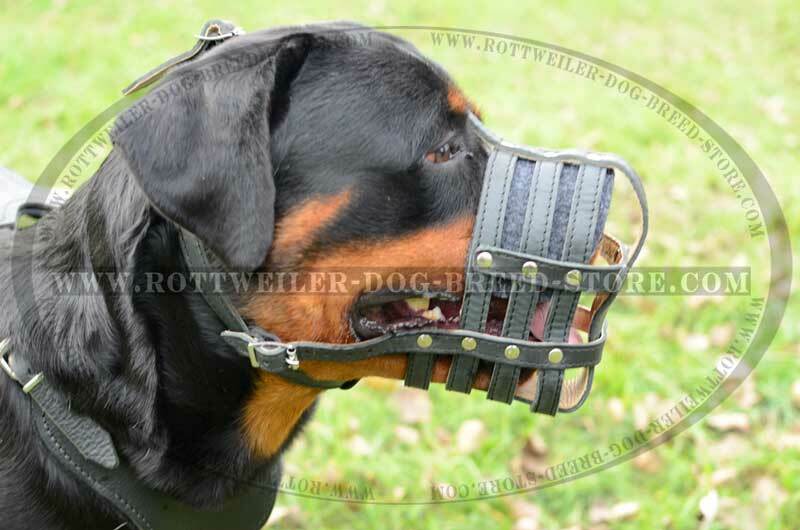 This dog muzzle makes it possible for Rottweiler to pant freely, drink water and eat small dainties. 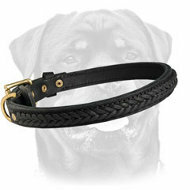 It also has a forehead strap that goes between Rottweiler’s eyes for avoidance of pawing the muzzle down. 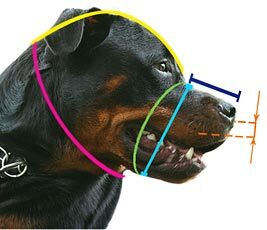 For correct size of muzzle you need to measure your Rottweiler’s snout approximately 1 inch below its eyes. 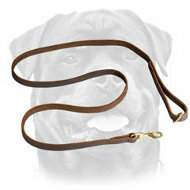 When ordering a muzzle you should choose that is 3/4" to 1 inch bigger than the circumference of your dog’s snout. If a muzzle size is the same as your dog’s snout it will be unable to open its mouth. 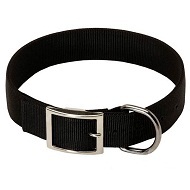 Therefore your dog should have enough room to pant or when wearing a muzzle. This leather dog muzzle can be used for short time periods in order to prevent Rottweiler from barking, chewing and biting. 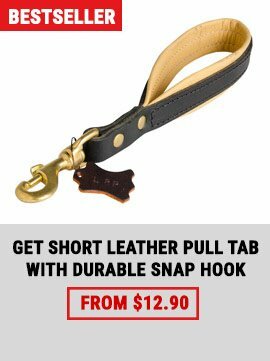 This is an effective and safe technique for training of a dog. 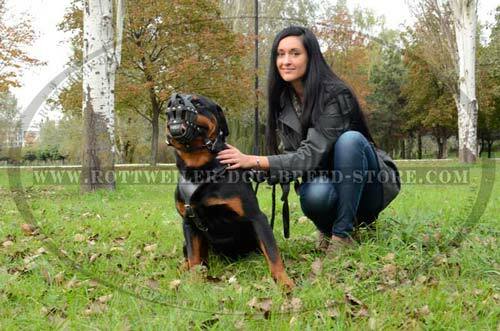 Rottweiler is not a dog for everyone. Many accidents connected with aggression of this dog breed are known worldwide. But not all Rottweilers are the same. More often than not this dog is big-hearted and attached to its owner. 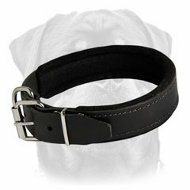 The dogs of the breed Rottweiler originated from ancient shepherds mastiff type dogs known from ancient times. For past centuries Rottweilers have undergone changes in height and color but mainly preserved exterior of their forefathers that existed more than 2000 years ago. Also they have kept working capacity, faithfulness and bravery. 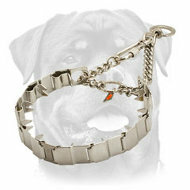 Rottweiler is quite a dependable dog provided that management of this dog is in congruence with its needs and nature. When serving Rottweiler can be aggressive towards strangers therefore its owner should bear this fact in mind. This dog is not nervous, however, as a rule it does not allow unfamiliar people to stroke itself and it is uneasy for a casual man to move in game with this dog. Consequently, it is necessary to teach it to execute commands. But one should understand that a command must never be contradictory: if you do not permit Rottweiler some way of behavior you should do it without exclusions and with friendly strictness. 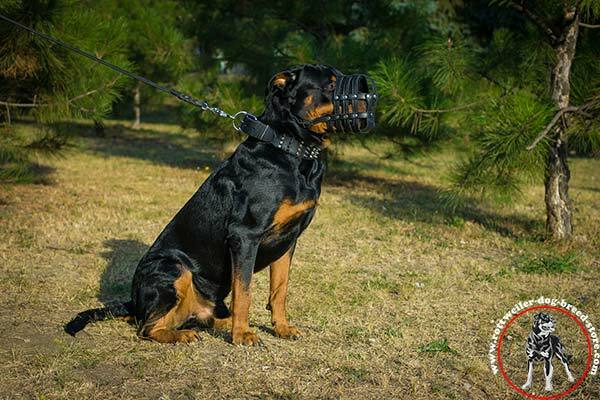 Contradictory commands frighten Rottweiler who is very methodic and has its own habits and they frighten it to such extent that the dog does not know which way of behavior it should follow and as a result the dog just starts to behave according to own desires and becomes uncontrolled. This is dog you can’t be absolutely cruel with. Its owner should behave positively and consequently as well as always have a little room for emotions. Rottweiler understands when you talk to it though does not comprehend words said but experiences the sense of solidarity and commonness being established between it and its owner by talking. 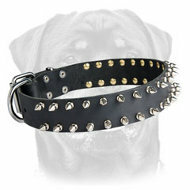 You should not even put this dog on the leash as it is sure to become very aggressive. If all these prescriptions are considered Rottweiler will be a reliable and attached friend for all its family, this dog is too calm and gets well along with children and it is a dependable guardian of property. Rottweilers.Interesting facts on the breed. - READ MORE!